For those of you new to Post Pals, welcome. We are a small charity run by volunteers (who are ill themselves) helping make seriously ill children and their siblings smile as well as supporting bereaved families through the sending of cards, letters and gifts. 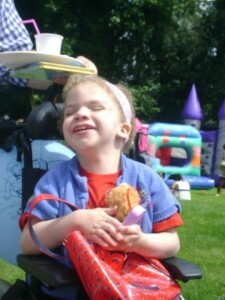 Once a year we hold a relaxed party which is an opportunity for all our families around the UK to come together. The kids have so much fun amongst others who understand (one year lots of children decided to compare their tubes with each other) and the parents can relax. A family said “it’s the one day of the year we don’t have to pretend to be normal” and another said it was the first time their severely disabled daughter had ever been included as people often don’t see past her disability to the little girl she is. This years party is on the 29th of June in Surrey. We are only small and the party is a struggle for us financially (but worth every penny and every bit of the time it takes) so it was suggested we publish a list of things we need or would like, the list is long and varies from expensive items, to secondhand things and right down to our need for used sweet wrappers to make the children smile! We have Paypal, Justgiving and can accept cheques or bank transfers as well as having the items sent to us, which ever is best for you. If you can help us in anyway please contact us on viks@postpals.co.uk. Thank you for taking the time to read our list. -Singing Hands, they sing and sign, this went down so well last year with lots of kids joining in, one of our pals who was 10 at the time also moved her hands during it for the first time in her entire life! -Octopus Parties, the wonderful Johanna does face painting and an interactive show taking kids on wonderful adventures, last time they went under the sea to try and find the pirates treasure. 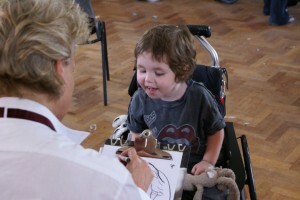 She signs during this and includes children of all abilities. Minnie and Mickey Mouse will make their first appearance at the party, having fun with the kids. After the party they will be shipped around the UK so the children can have visits from them at home, in hospital or at the hospice. 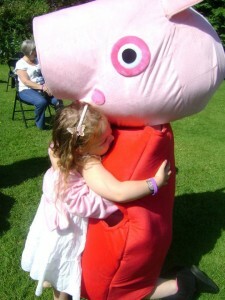 We have a Peppa Pig suit from the same company which is excellent quality and about the same price as hiring it for a day would be. 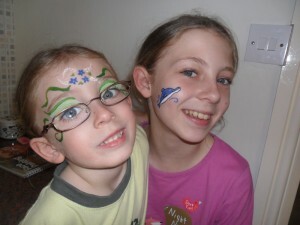 -Experienced facepainter, our Octopus party entertainer does face painting but if another face painter would be willing to come along it could speed things up and give Johanna more time for the show. -Drinks, snacks, sweets, treats, allergy free/special diet food, normal comes to around £200, if you know a company or can donate an item like fancy sweets, fruit flowers/fruit presented in a fun way, nice snacks or anything would be gratefully received (party in Surrey). 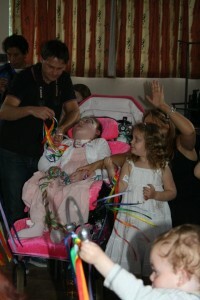 -Big cake, we would love a special cake to celebrate our 10th birthday to be enjoyed at the party by everyone. -Party bits and bobs, plates, cups, streamers, paper lasers (these went down so well last year and parents ended up targets although one pal found it funniest to unravel the whole thing then get her dad to wind it back up) I got them from here but didn’t have enough for each child who wanted to join in), bubbles, table cloths, cutlery, straws etc. This tends to come to around £200 but happy to accept a packet or two of blow outs, a pack of streamers etc. -Candyfloss machine, does anyone have one we can borrow or donate (the type that you get at events rather than the table top ones that don’t produce much). -Party invites, we don’t normally send invitations through the post but if anyone makes cards/invites it would be a lovely touch. -Helium for the balloon release, 3 of the ‘party canisters’ that party shops online sell or a canister of helium (the size of the ones you get in the shops). -Forget-me-not seeds for the balloon release, about 10 packets. -Big car to help on the day, we live less than 5mins away from the hall but only have a small boot in our family car, if someone who has more space could help by doing a few runs to the hall and back it would save us a lot of time! -Photo booth, these are very popular at the moment and I know kids would have a lot of fun. Looking for someone who can take the photos but also supply props (things like silly hats), there seem to be a lot of companies doing this at the moment and tons of ideas on pin interest/google. -Video, as its our 10th birthday we would love to have a space where people can record their thoughts about Post Pals and also capture some of the fun of the day so looking for a volunteer with experience and a camera. -Mickey/Minnie items, someone said they can get Mickey ears for £1.05 each and it would be nice to take home to remember meeting Mickey/Minnie with, looking for either someone to sponsor or if you are able to donate other Mickey items. Our families are all over the UK but we all like to come together. Some families are unable to afford the petrol or hotel stay (if they come from a long way, and a lot of children need to be hooked up to IV pumps early evening which couldn’t be done traveling they stay over). If anyone could sponsor a family, contribute to petrol or works for/is able to get a discount for Travel lodge it would be much appreciated. It tends to be about £100 per a family. -Donations for lunch, we plan to offer families a choice of McDonald’s things (burger, wrap, salad, happy meal etc) as people with dietary problems can find out in advance what they can have unlike different restaurants there. Any donations including discount coupons, luncheon vouchers or any type of discount would be helpful. -T-shirts with our logo so families can spot each other, looking for them to be printed or sponsored, happy to have ‘sponsored by’ on. The total dreamlist of things of extra things that we can’t afford and aren’t essential but would be dearly loved so posting on the very tiny off chance someone might be able to help! -Confetti Canon or exploding balloons (with flutter fetti/tiny balloons in), either someone to do it for us or having the things needed donated and we do it ourself on the day. -Hall decorations, the hall is fantastic but very drab, we hang up our nice bunting but nothing else as we can’t justify using donations on decorations however we would love a lovely looking hall, I was thinking of balloon decorations that some companies do but open to any ideas/offers. -Although we have a party once a year we create smiles on all the other 364 days by the sending of cheerful post. We are always in need of people to send a cheerful card, little gift, postcard or for children to draw pictures. -Starburst (opal fruit) wrappers for a volunteer who makes them into bracelets for all the Post Pal children. -Ball, we are holding a ball in October at Effingham Golf Coure please email viks@postpals.co.uk if you are interested. Let’s keep Alice’s kindness going! We are very sad to say Alice passed away today. Alice joined Post Pals many years ago as a sibling while Milly was going through multiple operations. 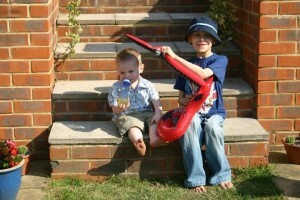 We all remember when she first got ill and joined as a Pal the day she was diagnosed, she fought so hard and for so long. After Alice’s bucket list went viral the whole world found out how special Alice was, right until the end she was working to help others despite what she was going through. We were lucky to know Alice for so long and we also knew how kind she was, always thinking of others long before cancer came into her world. We are very sad to announce that Amelia passed away today, she had her Mum and Dad at her side and slipped away peacefully. Amelia wasn’t with Post Pals for very long but received lots of post which brought her great joy, she had over 100 Christmas cards which helped make her Christmas special. Hello to everyone reading! We hope you have all had a very Merry Christmas and we wish you all the best for 2013! Sending balloons to children having a difficult time. 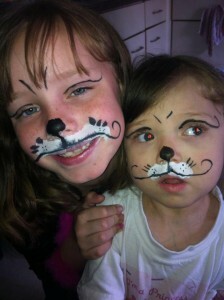 Cool face paint books and kits which children and teenagers of all ages enjoyed and are still having fun with. Tickle paws (they roar when you tickle someone). 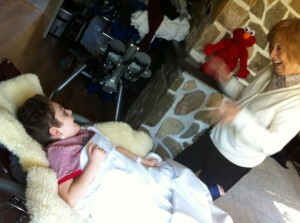 Granted Lewis’ wish for an Elmo Live which was waiting for him when he got home from hospital with help from Strong Bones. 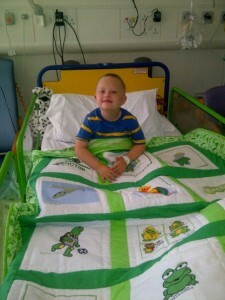 Quilts for a children to snuggle up with. Special bracelets to Milly and Alice with ‘sister’ on and a lovely poem about journeying through life together. 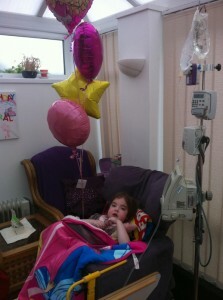 Pizza, a drink and chocolate cake to Poppy’s Mum who hadn’t had a meal for 3 days as she sat by Poppy’s bedside in HDU. Bedroom doorbells that children can record their voice into. The lovely Sapphire B has sarcoma which is cancer in her stomach. 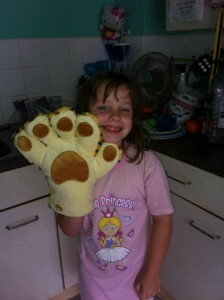 She has had operations, lots of chemotherapy and has spent most of her time in hospital since her diagnosis. 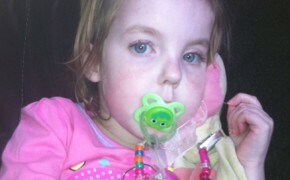 The doctors have said there is nothing more they can do for her so her family are looking for trials elsewhere. Sapphire is still a typical teenage girl who is 13 and loves music, nails, make-up, horseriding, dogs, animals, art and her favorite color is pink! Could you send some post to her and give her a warm welcome to post pals? 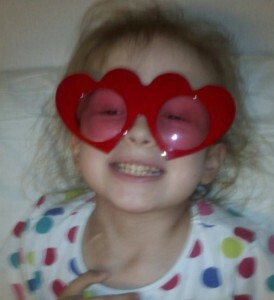 Little Amelia is 4 and has a brain tumour. 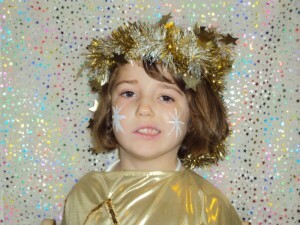 The tumour has progressed quickly and they feared Amelia would not make it to Christmas but they are now hoping she can manage Christmas at home before returning to her local hospice. Although very poorly Amelia is loving receiving post and its been making her smile. The wonderful Lydia M has also joined us this week! 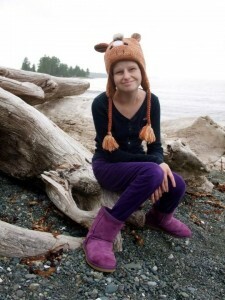 Lydia has medulloblastoma which is a cancerous brain tumor. Lydia also has Gorlin Syndrome which means she can’t have radio therapy and has already spent most of her life in hospital! 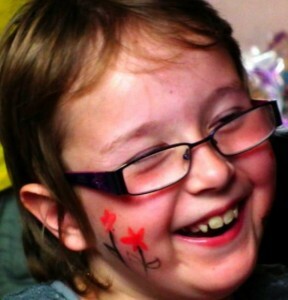 Lydia faces everything with a smile and loves to make people laugh with her imagination games. Lydia is a 6 year old girl who loves pirates, stickers, lego, cartoon animal films, transformers, books, disney princesses, dinosaurs and music! Lydia loves all post but please don’t send her any food because of her food allergies. Our TLC pals need a bit of TLC! All three of our new pals are on our TLC page this week. Sapphire is now on palliative chemotherapy as the doctors say her cancer can’t be cured so she would love some post to make her smile. 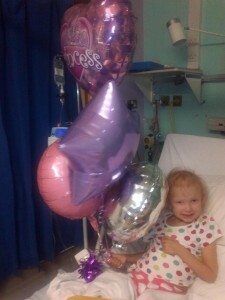 Lydia is spending all her time in hospital with chemotherapy and infections so she’d love some cheerful post! 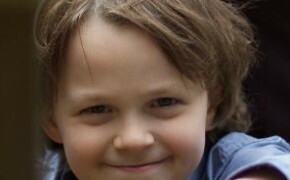 Also on our TLC page this week we have the wonderful William S who has been waiting for a heart transplant for a very long time! His health is getting worse and he’s in and out of hospital a lot! 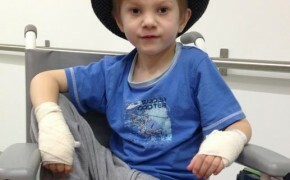 He really needs his new heart soon so some cheerful post would really make him smile! The amazing Adam B needs some cheerful post as his cancer has started to grow and spread again so he is having treatment in the UK and USA. 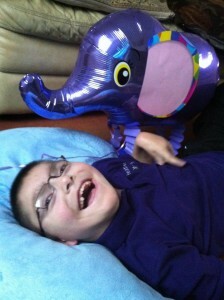 Could you send him a card to make him smile? 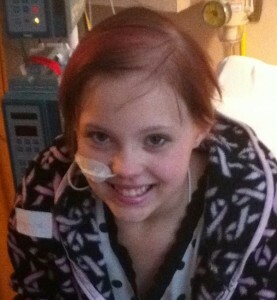 The lovely Poppy H has had a really tough year and spent most of it in hospital! She could really use some post to make her smile! Thank you to everyone who has taken the time to make Pals smile this year.